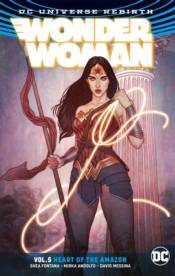 In this new collection, Wonder Woman takes a moment to catch her breath and attend a friend's wedding�but unfortunately, horror follows her even there, putting the life of her friend Etta Candy in danger! Then, learn more about the tumultuous partnership between Wonder Woman and Steve Trevor. Collects stories from WONDER WOMAN #26-30, WONDER WOMAN ANNUAL #1 and WONDER WOMAN: STEVE TREVOR #1.